YOHANAN BEHAM. 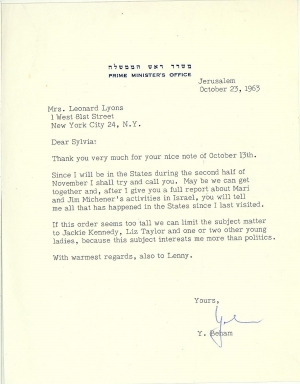 Typed Letter Signed “YBeham” to Sylvia Lyons. Jerusalem, October 23, 1963. On stationery of the Prime Minister’s Office. 1 p., 6½ x 8¼ in. Jim Michener is probably James A. Michener (1907-1997), the American novelist. Beham was Director of the Israeli Tourism Office and the Israel Museum.